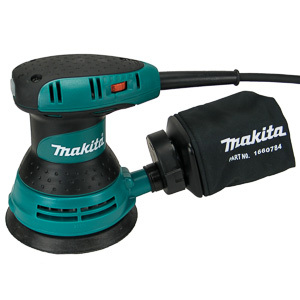 Working our way through the lineup of 1/4 sheet palm sander Makita's offering has found its way into our shop. The BO4556 made a great first impression when it arrived in a rugged and stylish looking carrying case. The sander concealed within, however, was very pedestrian looking. Knowing that looks can be deceiving, we put the BO 4556 through its paces. Let's see if the tool was able to impress, or sink to the level of mediocrity that is so common with palm sanders. The Makita Bo 4556 follows the knob-style design common among 1/4 sheet sanders. Thankfully this tried and true design gives the sander excellent handling. The power switch at the front of the sander is covered in a protective clear rubber casing to keep the dust out. The switch is the only control found on the BO4556. It's motor always turns at its maximum speed of 14,000rpm. At 2 amps the BO4556 is slightly under-motorized compared to some of the competition. It appears Makita choose to position the BO4556 near the sweet spot for 1/4 sheet sanders rather than challenge for the title of most powerful. This may have been a wise decision considering that a 1/4 sheet palm sander is a precision tool. 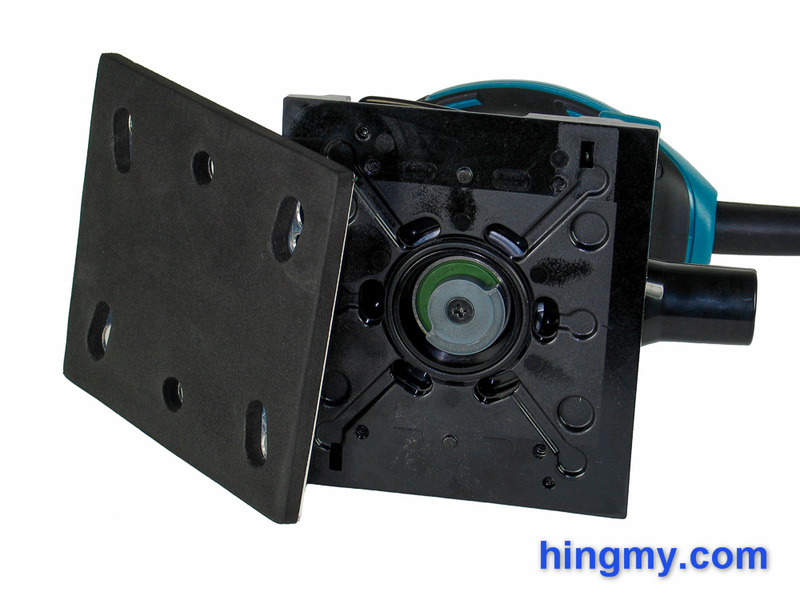 The base plate of the sander is made from plastic. A metal sanding plate covered with foam attaches to it with four screws. While the base does not leave one with the best of impressions, it follows the trend among 1/4 sheet sanders towards the economical end of the spectrum. 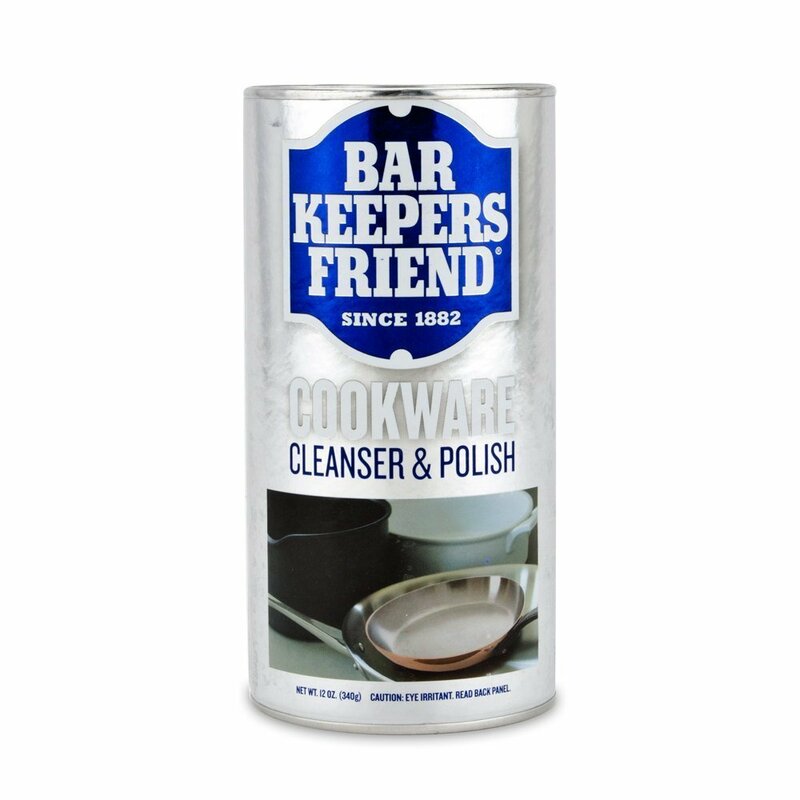 The sandpaper retention mechanism uses the metal locking arms found on so many other models. It works just as well on BO4556 as it does on other sanders. The clips secure the sandpaper without any movement under all conditions. The pressure excerted by the clamps was well chosen. Makita shows a little attention to detail by covering the control arms with rubber. The makes for more comfortable paper changes, but not necessarily for a better tool. Sand paper changes are exactly what you'd expect from a sander that uses clamp arms. The small dust port at the rear of the tool does make the process a little easier on the BO4556 than it is on most other machines. Makita has equipped the BO4556 with an unconventional 6 hole dist collection system. Unlike the common 8 hole system where the dust intake holes are aligned in circle, the holes on the Makita are arranged in two rows along the front and back edge of the pad. A hole punch that matches the tool's intake pattern is provided with all versions of the sander. The dust port in the rear of the tool is unusually small. Instead of the oval design other sanders use, the port on the Makita is circular. This makes it far smaller opening than the oval design. On the plus side the circular shape of the port allows connection of a dust hose without an adapter. At 22mm in outer diameter the port is the right size for most hoses. Unfortunately the port is made from slick plastic, which can make for a weak connection when worn out hoses are used. The kit includes a dust bag replaces the dust hose when a dust collector is not available. The bag depends on its cloth walls to filter the air. A metal bar near the top of the bag helps it keep its shape and prevents the bag from sagging as it gets full. 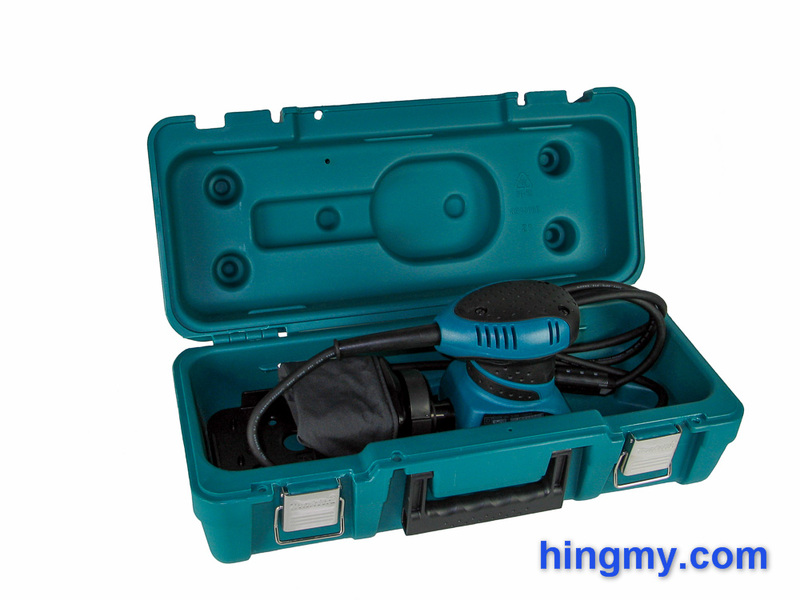 The soft rubber adapter at the front of the bag slides securely over the dust port of the sander. To empty the bag the adapter unlocks with a quick 1/4 turn. In use the efficiency of the dust collection is measured. Dust collection performance with the bag attached seems to be slightly worse than on competing models with a 8 hole layout. The tool does an admirable job drawing air in, but it cannot keep up with the larger surface area of the intake holes on other sanders. The dust bag does not help the situation. While it does filter the air, it is clearly inferior to the paper filter design found other sanders like the Bosch. It's as if Makita threw the bag in as an emergency measure in case a dust collector is not available. With a collector attached to the dust port the Makita BO4556 shines. Having 2 fewer intake holes don't hold it back. Dust collection performance is as good as it is on any other 1/4 sheet sander. The small circular port becomes an advantage. 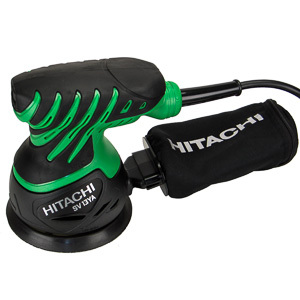 Without an adapter between the tool and the dust hose, the BO4556 feels more stable than the competition. The small palm sander category is a very competitive market. The industry has settled on producing inexpensive designs. Most sanders are semi-disposable. They'll work well for a long time, but they clearly have an expiration date built in. Only a couple of models offer superior quality. With all the sanders so close in specs, the choice comes down to the unique features each sander offers. The Porter-Cable 342 is the leader in the quality department. It's metal-base plate gives it an edge in market full of plastic. Bosch equipped it's offering, the 1296DK, with a cartridge dust filter system. We have not tested it yet, but cartridge filters usually outperform cloth bags by a wide marking. Milwaukee's 6020-21 took a different route. It leads the motor specs. The carry case that comes with the kit version of the BO4556 is of superior quality. The thick plastic walls and strong hinges will withstand the rigors of the job site longer than the tool itself will. The molded interior secures the sander in place without any rattles. The metal clamps keep the case closed tightly, but do not keep out the elements. There is enough room to store the sander and punch with ample room left over for sandpaper. The case is about as good as a carry case can be that is not part of a system. It only starts to fall down when you have to carry 5 or more cases to a job site. When being judged on its own merit it gets full marks. The sander performs admirably in the shop. The flat foam covered sub base creates an even surface for the sandpaper to lay on. The results is a perfectly flat surface on the material you are sanding. There is some uplift in the corners, like there is on any palm sander. The BO4556 does produce a visible scratch pattern, if you are not careful to move it around a bit as you sand. With some care a finish-ready surface can be produced with very little effort. 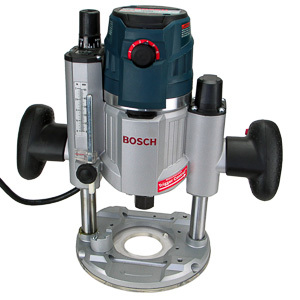 If you are looking for a mirror flat finish, however, you need to move on to an orbit sander. The BO4556 cannot help you here. 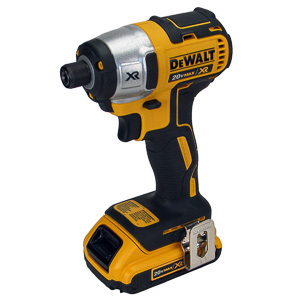 As for speed the BO4556 hangs with the slightly more powerful DeWalt and Porter-Cable sanders. All sanders sanded through the top layer of a sheet of cabinet plywood in about the same time. It's hard to attribute the few seconds of difference to the tool itself when there are other variable such as varying wood thickness to consider. Given that all the sanders vibrate at 14,000rpm the result is not that surprising. The vibration reduction feature touted in the sander's spec certainly does its job. The sander is pleasant to hold during multi-hour sanding sessions. On the flip side the tool fails to distinguish itself from the competition. Built-in vibration reduction or not, the sander feels about the same in your hand as the others do. Being average is not a bad thing, as the sanders on the short list all performed admirably. A nice feature of the BO4556 that is not immediately apparent is how fast the sander comes to a stop. The plate stops vibrating just under two seconds after the power is cut. 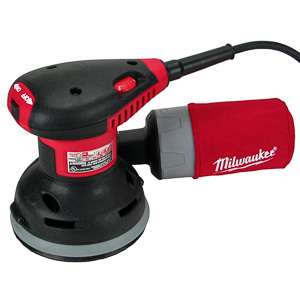 This is unusually fast for a sander in this category and certainly useful. Being able to put the sander down quickly does speed up work. 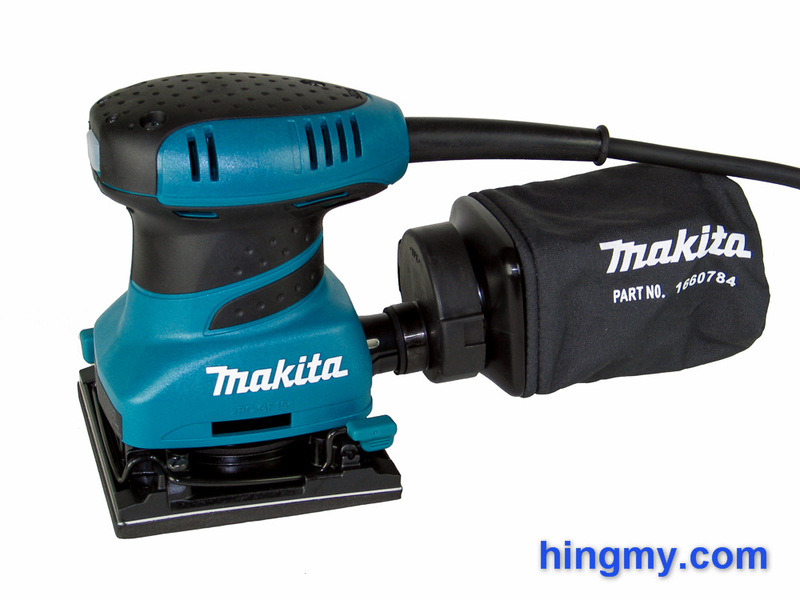 With the BO4556 Makita aimed for and hit the center of the 1/4 sheet palm sanders market. 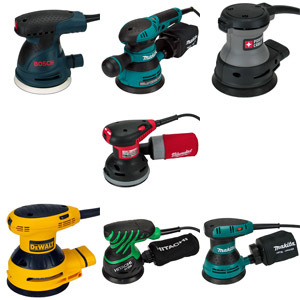 In a competitive environment the sander finds itself surrounded by competitors that look and perform almost identically. Being built economically the BO4556 stays with its competition in the price race. Build quality is good for a tool in this category. This sander won't serve you for a decade, but it won't break the bank either. 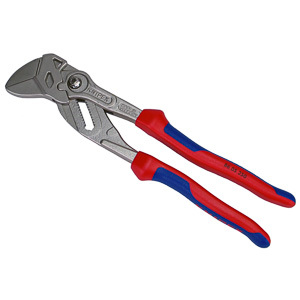 The BO4556 is a very average tool. It does everything it needs to do right without going an inch beyond what is necessary. Some of us value this as being predictable. With so much of the BO4556's performance being close to the competition, the few things that make the sander special are what you should concentrate on. A novel 6-hole dust collection system, an excellent carrying case, padded paper clamps, and a circular dust port distinguish the BO4556. Any one of these may be enough sway you in the direction of the Makita. If you do choose to purchase the BO4556, you can be certain it'll perform about as well as the other sanders in its price range. This is not the sander that breaks the tie at this price point.